The SEAT Leon Cupra range is now available with savings up to £1945, as well as a free upgrade to a DSG-automatic gearbox. Discounts apply to all three Leon Cupra 300 bodystyles: SC (Sports Coupe), five-door and ST (Sports Tourer). However, the Leon SC Cupra 300 DSG-auto gets from the largest saving, with £1945 taken off of its previous price. The best-selling five-door and ST are just a smidgen behind losing £1905. 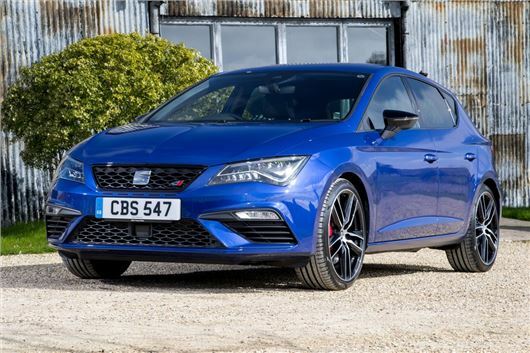 Customers can also opt for the six-speed DSG-auto in SEAT's 300PS hot hatch, which is now priced in line with the six-speed manual versions (typically a £1350 additional cost). The three manual versions each see price reductions of £555 too. The model features 19-inch alloy wheels, SEAT Drive Profile, Dynamic Chassis Control, auto lights and wipers, Full Link (integrated Smartphone connectivity: MirrorLink, Android Auto and Apple CarPlay) and dual zone climate control. Leon Cupra 300 models (excluding Cupra R) will also be the first cars in the SEAT range to receive Digital Cockpit. As seen in other Volkswagen Group vehicles, the driver-configurable display presents information about communication, driving, media and navigation. The multi-function display is a compact information unit, positioned directly in front of the driver on the dashboard for convenience and safety. It allows the driver to see important information at a glance, without taking their eyes off the road. Any current Leon Cupra 300 orders which have been processed, but not yet registered, will automatically be updated with the new pricing and specification.